Skin Doctors Cosmeceuticals are industry leaders in the development and marketing of breakthrough, clinical strength cosmeceuticals that offer consumers topical alternatives to surgery. Skin Doctors products are based on cutting edge formulations developed in conjunction with leading research institutes and cosmetic surgeons. Our formulations are helping to change the way people perceive skincare and the results it can deliver. The Skin Doctors brand balances a serious, scientific, efficacious function with the aspirational appeal of beauty products. This clinical, aspirational balance is reflected in the products, packaging and marketing. Skin Doctors drives innovation globally. In fact, we are now available in over 50 countries worldwide and growing. It is through our global networks we are able to stay ahead of skincare trends and deliver cutting edge formulations reflective of consumer needs. First, we believe the purpose of health and beauty products is to make an actual visible difference to your well-being or skin’s appearance and not just to appear as pretty packaging on the bathroom shelf. This is why we include optimum amounts of ingredients in our products not just enough to claim it as an active on the label. Second, we believe that a single measurement is worth a thousand opinions. That is why we do not trade in opinions, but will only offer products with ingredients that have been proven in strict scientific conditions or through hundreds of years of traditional use. Third, we believe in offering great value and selling with integrity. That is why we provide detailed product information including active ingredients to help you understand the science behind Skin Doctors and how the products work. Cosmeceuticals are cosmetic products that include ingredients designed not only to enhance the appearance but to also have a positive physiological effect at the cellular level. They provide lasting benefits and satisfy both beauty and health needs. Light years ahead of ordinary skincare, Skin Doctors is not just another range of “fluffy moisturisers” but rather cosmeceutical strength preparations formulated to make a real, visible difference to the appearance of the skin. Skin Doctors is able to “bridge the gap” between ordinary skincare and cosmetic surgery and that is why many of the results have been compared to cosmetic surgical procedures. 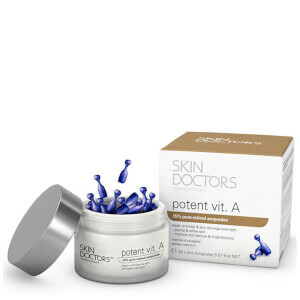 For every skin problem there is a specific Skin Doctors solution. The Skin Doctors range is the most comprehensive on the market, with treatments for almost every major beauty problem from spider veins, puffy eye bags, wrinkles and skin ageing, to pigmentation and even micro-dermabrasion and chemical peels. The range provides solutions that can be used in the privacy of your own home and they deliver dramatic results that require no recovery time, unlike surgery. They are a fraction of the price of a cosmetic procedure while being safe and non-invasive.